Unique opportunities with the National Pork Board and the Missouri Farm Bureau helped two Northwest Missouri State University students expand their knowledge this summer in the field of agriculture. Haley Fischer, a senior agricultural science major from Neola, Iowa, interned for Iowa Select Farms, where she oversaw multiple barns and cared for pigs. 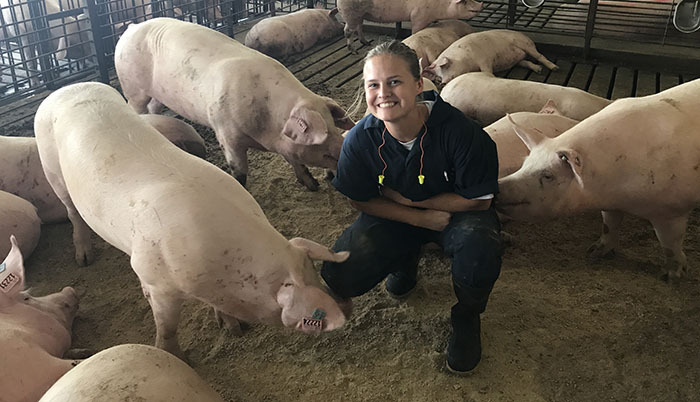 Additionally, she was one of 12 university students from throughout the country selected to be a part of the National Pork Board’s #RealPigFarming Student Social Forces team. Fischer is preparing herself to be career-ready with the strength of Northwest’s School of Agricultural Sciences and the home-like atmosphere of the University. Ninety-six percent of students who earn bachelor’s degrees in Northwest’s School of Agricultural Sciences secure a job or continue their education within six months of graduating. Katie Imhoff holds a magazine feature she contributed to during her internship with Missouri Farm Bureau. 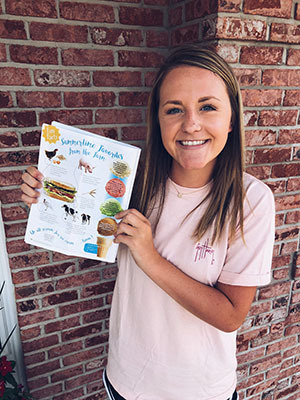 Katie Imhoff, a senior agricultural business and public relations major from California, Missouri, all benefitted from an internship this summer. Imhoff, who grew up surrounded by agriculture and politics, received an opportunity to intern with the Missouri Farm Bureau that she couldn’t pass up. Imhoff connected with politicians and agricultural leaders, created social media content for the Farm Bureau and gave agriculture advocacy presentations. Northwest’s School of Agricultural Sciences serves about 12 percent of the University’s undergraduate population. The School offers facilities such the 448-acre R.T. Wright Farm – which is home to beef, swine, dairy and sheep enterprises as well as row and forage crops – a horticulture complex and applied research and demonstration plots that provide students with hands-on, profession-based experience. The School of Agricultural Sciences offers agricultural majors in agricultural business, agricultural education, agricultural science, agronomy, animal science, animal science-pre vet and horticulture in addition to minors, a two-year farm operations certificate and master’s programs in agriculture, education and economics. For more information about the School of Agricultural Sciences, visit www.nwmissouri.edu/ag/.